Located only 1 hour away from Acapulco, Tehuacalco is the most recently discovered archaeological site in Mexico and lies in mountains of the Sierra Madre. On a tour with your guide, learn about these archaeological ruins associated with the Yope people and see the ceremonial center dedicated to the cult of the water. After pickup in the morning, leave Acapulco from your hotel or cruise ship terminal and experience the impressive countryside of the Sierra Madres. 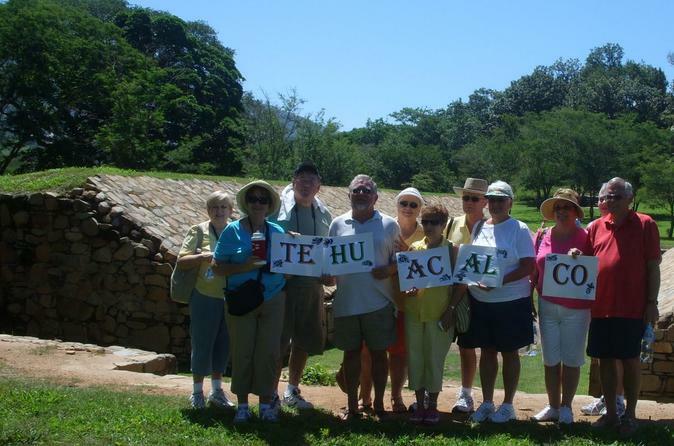 As you travel on your way to the Tehuacalco archaeological site, your guide will share insight about the local Mexican lifestyle and other topics of interest. Prepare yourself for a unique experience: to be one of the first visitors to Tehuacalco while your guide takes you back through the ages. Tehuacalco is known for its large structures. The monumental area encompasses 12 acres (4 hectares) and includes more than 15 different structures. Among them you will see the great pyramidal base rising 60 feet from the ground. The base features a large staircase, walls, and patios. The name of the site comes from the Nahuatl phrase 'tehuacalli,' which refers to holes bored into stones to be used for ritual purposes. It can be interpreted various ways such as 'place of the stone box,' 'house of priests,' or 'house of the sacred water.' While it is not completely certain, there may have been Yopime or even Tlapaneca settlements here as well. Occupation of the site began around 400 AD and reached its height between 650 and 1100 AD. Fascinating engravings depict what may have been the very first ball game. Your guide will point out incredible petroglyphs dedicated to the water, lined up from north to south of the site. Marvel at the excavation site and see the moon marks, the sun observer, and the way of life between religion and government. After your 2-hour visit, head back to Acapulco for drop-off at your original departure location.